Lighting Global supports the growing global market for modern off-grid energy with a widely applicable, rigorous Quality Assurance (QA) framework. The key QA activities include measuring, benchmarking, and communicating information about product quality and performance. Affordability: Support an appropriate balance between product cost, quality, and performance. Diversity & Innovation: Encourage product diversity and innovation with non-prescriptive, outcomes-based benchmarks. Rigor & Accessibility: Use rigorous tests that can be carried out with reasonably low-cost instruments. Stability: Maintain stable and transparent policies so stakeholders know what to expect. Insight: Effectively communicate key product quality and performance information to buyers. Lighting Global has been a critical force in facilitating and promoting quality solar lanterns and home systems since our industry’s infancy. 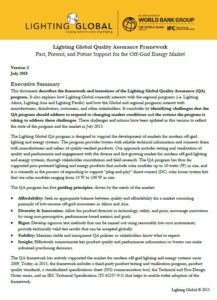 Lighting Global’s quality assurance program catalyzed off-grid solar energy’s exponential growth: It legitimized novel technologies in the eyes of distributors’ worldwide, stimulating innovation while protecting consumers and manufacturers alike from the dangers of low-quality products. 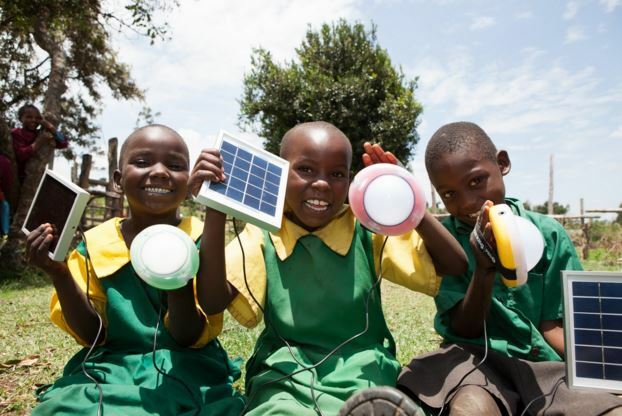 Lighting Global’s work with governments in harmonizing regulations and reducing barriers to trade created a level playing field for companies and made solar energy affordable to millions of off-grid families. The Lighting Global QA framework served as the foundation for—and is now based on—International Electrotechnical Commission (IEC) Technical Specification 62257-9-5. This IEC specification provides the global QA framework for off-grid lighting. All supported products are required to meet the Lighting Global Quality Standards. These benchmarks are designed for wide applicability across the market and define a baseline level of quality for consumer protection. We provide trusted and easy-to-use summaries of laboratory test results for products that meet the Lighting Global Quality Standards. Access the verified test results using Lighting Global Standardized Specifications Sheets. Lighting Global uses rigorous yet affordable product testing procedures to determine if a product meets the Quality Standards. Products are tested according to test methods in IEC/TS 62257-9-5. Lighting Global Quality Assurance began testing in 2008. Initially. these efforts occurred under the auspices of Lighting Africa. Then in 2012, the QA program transferred to Lighting Global, which serves as a global platform to provide support for a wider range of international stakeholders. We maintain a library of our current program documents to provide transparent and detailed information about the Quality Standards, sample selection process, testing policies, and the QA program as whole. How Can I Engage with the Lighting Global QA Program? Check out our Stakeholder Engagement page to learn how to provide input on Lighting Global activities. If you are interested in having a product tested, review the Testing Process flow chart and then Contact Lighting Global. Contact Lighting Global to discuss using IEC/TS 62257-9-5 to set up requirements for a bid specification for bulk purchase orders or other program activities.